Evening of sweets in the garden, all prepared by carlo! 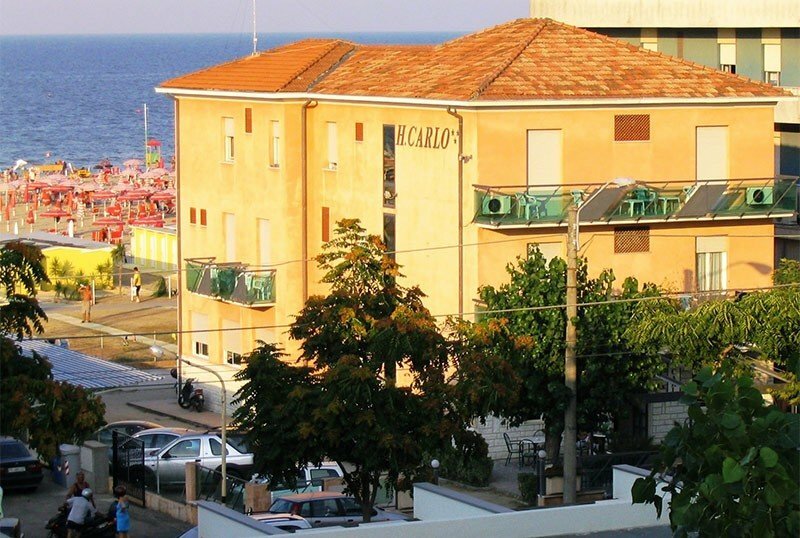 The Hotel Carlo , a 3 star family run hotel in Miramare di Rimini, is located on the seafront just a short distance from Riccione and the Fiabilandia park. The hotel is included in the AIC (Italian Celiac Association) circuit and prepares complete menus for people with celiac disease. Accept small animals. The hotel enjoys a strategic position, in fact it is located on the seafront, full of shops, pubs and clubs; It has direct access to the Miramare beach in Rimini and is just a few minutes drive from Riccione and the Fiabilandia theme park. The other parks such as Oltremare, Aquafan, Italia in Miniatura are easily reachable also by public transport, whose stops are close to the structure. All rooms have independent air conditioning, free WI-FI, beds with wooden slats, electronic safe, LCD TV and telephone. CLASSIC : cozy and modern room with 25 "/ 28" LCD TV. Available with double bed or with 3/4 beds. FAMILY : room with 3 or 4 beds, ideal for families, large balcony and 32 "LCD TV. QUALITY : bright room with sea view balcony and 28 "LCD TV. Garden, open-air porch, reading room, TV room and bar service, math and physics repetitions on request. PARKING : uncovered, fenced and available to all customers. CONVENTIONS : beach, amusement parks, discos and spas. BREAKFAST : international buffet breakfast with sweet and savory choice. LUNCH AND DINNER : 2 first courses and 2 second courses of meat, fish and vegetarians, all on the plate. Desserts and pasta are homemade. VARIATIONS : The same menus in gluten-free version are proposed for celiac (the hotel is included in the AIC - Italian Celiac Association), bread, pizza, focaccia, piadina and strictly gluten-free pasta are prepared. In hotel : indoor and outdoor playground area, strollers and baby sitter and pediatrician services on request. In the room : cots at no extra cost. At meals : baby menu, baby food, bottle warmer on request and seats at the table. On the beach : entertainment, playground, cabin for babies. The hotel has an agreement with the bathing establishment located in front of the structure, Bagno Orchidea n. 129, equipped with sunbeds and beach umbrella, mini gym, mini basketball, ping pong and table football, cabins equipped for newborns, bowls and medical service. In addition, the entertainment service is available and lots of activities for adults and children: games, treasure hunts, baby dance, sand castle competitions, bocce tournaments and table tennis, water gymnastics, group dances. Prices are per day per person full board, min. Three days. Spend beautiful days relaxing on the beautiful beach of Rimini. You will find it different and fascinating, there are still no umbrellas and the beach is all for you! Special discounts for children and family plan! And with just € 8.00 more you will have full board !! - free wi fi and parking! And with just € 8.00 more .... Full board !! ALL-INCLUSIVE OFFER 13-23 JUNE IN THE HOTEL ON THE SEA IN RIMINI !! ALL-INCLUSIVE OFFER WITH UMBRELLA AND BEDS ON THE BEACH! request a personalized quote now! Booking a stay with the All Inclusive formula. Full board, mineral water, air conditioning, parking, wi fi ... All inclusive! Ask us for a personalized offer!